If you are working in windows operating system and if you want to find out the Microsoft operating system product keys already installed in your system, then this how to guide is for you. You need a free software to recover your serial keys. I would suggest Magical jelly Bean Key Finder or Enchanted Keyfinder. Magical Jelly Bean loads very quick and finds the product keys for you. You can find my screenshot below. I installed in my system, loading with Windows 7 Home premium. It was listed my Operating System key, Ms Office key and my IDM serial keys. 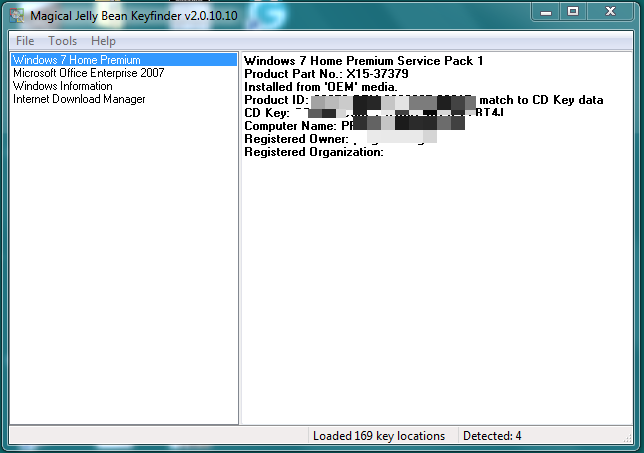 Without this software, it is really hard to find your installed serial keys. Recover Serials of Office 2010, Office 2007, Vista, & Windows 7 and Windows 8. Just take a try to load and save your serial keys for future use.